Muito lindo! Decididamente tens mãos de fada. I think you are very brave using large pieces of fabric from Kaffe. I really struggle using his fabrics and have decided that maybe I'm just a 'grey based' girl stuck in her 'country' rut. I'll look forward to your newsy once a week posts Lurline. So glad you are getting to do more things. Your applique is gorgeous!! Right now instead of dead heading plants they are all just falling apart themselves. It is getting colder and colder everyday. I would swap for your weather any day. Enjoy your gardening!! And by the way, I agree Kaffe can make you do anything with his glorious fabrics! Love your lollipops so far! I like the idea of my DH cooking instead of me too. lol! It must be frustrating for you to get used to your limitations. I think you need some Kaffe! 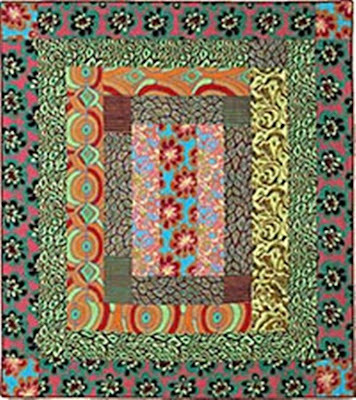 Love that quilt you're tempted by -- where did you see it? Amish Kaffe style -- so cool! 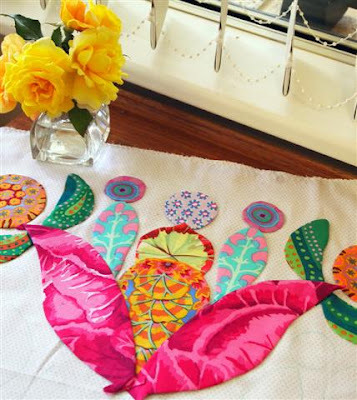 The applique is going to be a stunner! Can't wait to see it come together! Thank you for the glorious yellow roses, Lurline! I'm glad to hear your left arm is still improving. Beautiful fussy cutting on your Lollypop block. I'm totally diggin the lollipops! Hi I just spent the last 20 min or more reading your blog. Happy to hear your hubby is fine and you are on the mend. 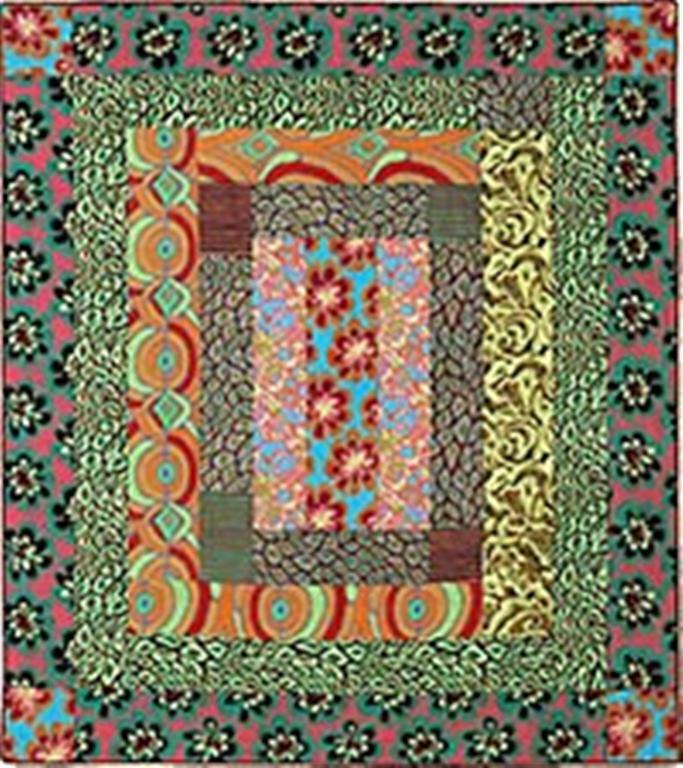 Love all your quilts and your Kaffe fabrics adore his work. Your work is just amazing Love your Lolli pops just beautiful. All the fussy cutting is paying off. I'm loving it! Your fussy cuts are beautiful, as are your roses! Beautiful use of Kaffes. And I applaud your desire to organize your time. I think we all need to reprioritize from time to time. Have fun getting your hands dirty....I love your fussy cutting and what you are doing with it! Your lolly's are beautiful! 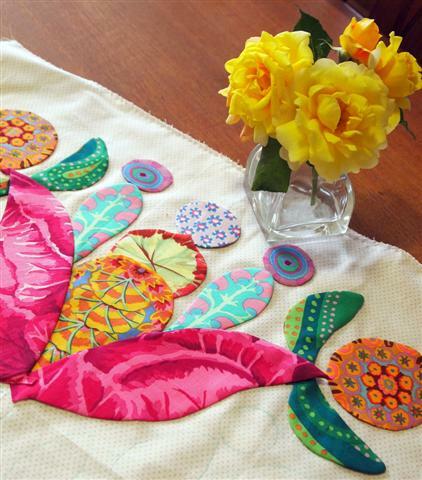 I am learning a lot about how to use those lovely Kaffe fabrics from all you talented gals! Time management is a difficult nut to crack. You are always so lovely and gracious to reply. 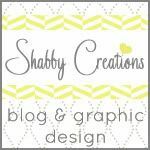 It would not offend me at all if you took me off your reply list...I love visiting your blog and will still leave comments, but would rather you spend that time sewing more lovely things to post and inspire! Most of my commenting on people's blogs is meant as acknowledgement and encouragement...a way to say "wow, you are fantasic! I appreciate you sharing with me so much!" We all appreciate those kinds of things, but at least for my part...thanks is not needed. Balance is hard to find...blogging shouldn't get in the way of enjoying quilting! You are definitely Kaffe's biggest fan...I love your applique! Be proud,your Kaffe is great.Super quilt,to be! Happy fussy cutting! Love the look. I do limit my computer time. I read Email early in the morning and read blogs while watching tv (I don't do hand appliqué) in the evening. If I didn't set some rules for me I wouldn't get any sewing done. Oh, and I only blog 1-2 times a week. I sure love your appliqué! Time management is the way to go.. too much time can get taken up on the computer. So glad your left hand is a lot more comfortable now.. The colors on those fabrics are just delicious. You are so patient to take the time to fussy cut, I'm sure it will be worth it in the end. Good luck with the pumpkin scones. 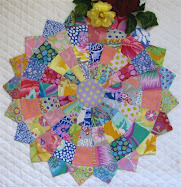 Fussy cutting is so intimidating - I want to use it all, not just a circle or so here and there! But in the end, as with your piece, it's what makes it fabulous! When I look at something just a little ho-hum, I think it could have been fantastic if it were fussy cut. Kind of like putting up wall paper but not matching the seams! My former sister-in-law did that once with a FERN patterned paper!!! It made you dizzy to look at it! Wonderful fussy cuts, Lurline! ; ) Glad to hear you've been making improvements and finding a new routine. Not easy. Did you get your hands dirty?! My husband says I'm happiest with dirt under my nails, sand on my feet and threads stuck to my clothes...it's ALL good!!! Oh yes this is wonderful!!! Love when you show those blocks in Kaffe. I just am not good at picking them out. But I love to see what you do with them.